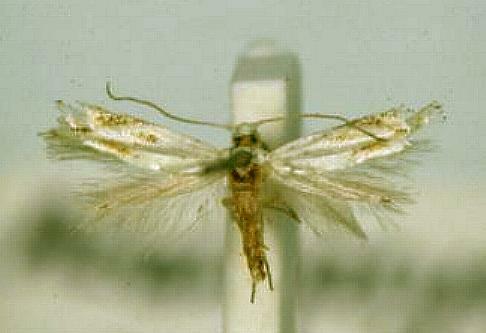 The adult moths of this species are white with three stippled brown areas on each forewing: One near the middle of the wing, one near the wingtip, and one at the tornus. The hindwings are off-white. There are off-white fringes of hairs on the trailing edge of each forewing, and around the whole of each hindwing. The antennae are nearly as long as the forewings. The moths have a wingspan of about 1 cm. Series 1, Volume 5, Number 2 (1880), p. 177.